In this new three-part series, we take a look inside some of our Science Labs for a glimpse into how teachers are creatively demonstrating lessons about various topics, such as blood spatter, DNA isolation, Newton’s Laws and…elephant toothpaste! In part one of our series, Ms. Elizabeth Holve gave us a glimpse into a few of her Middle Grades biology labs, such as growing mold. Our second installment featured Dr. Anuradha Murthy’s Upper Grades biology lab where DNA isolation was one of many interesting experiments. For our third and final installment of this series, we check in with Dr. Simon Hale’s Physics and Advanced Placement (AP) Physics classes for a taste of the personal flavor that he adds to each of his labs. Although his lab techniques may vary, Dr. Hale's students can always count on one constant: his passion for physics. He infuses that love for the sciences into every lesson plan and lab, and his students take notice; they absorb it, then release it right back to him through their hard work. Subject mastery is a difficult, yet an inherently important principle to BASIS Independent Silicon Valley students - especially science - and they experience in its finest form with Dr. Hale. On any given school day, you can walk into the physics lab of Dr. Hale’s class and instantly notice the wide-eyed captive student audience, who range between grades 6, 7 and 8. Given the complex nature of this particular science, Dr. Hale ensures that his lesson plans are strategically tied to labs so that the material can come to life and support the various complicated theories and laws. Let's see how he does it. Newton’s three laws of motion can be used to explain much of the observable world around us and how objects interact. In this lab, students utilize computer simulations to explore Newton’s laws by applying different forces to various objects (including a fridge and a sleeping dog!) and observing the resulting motions. 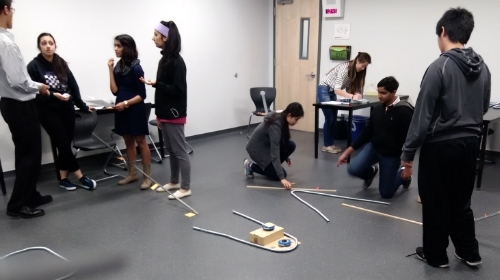 AP students are given the challenge to design their own experimental set up to measure various physical and mechanical properties. Utilizing inquiry-based science allows students to develop greater understandings of the world around them, than they would if they followed a cookbook style lab. 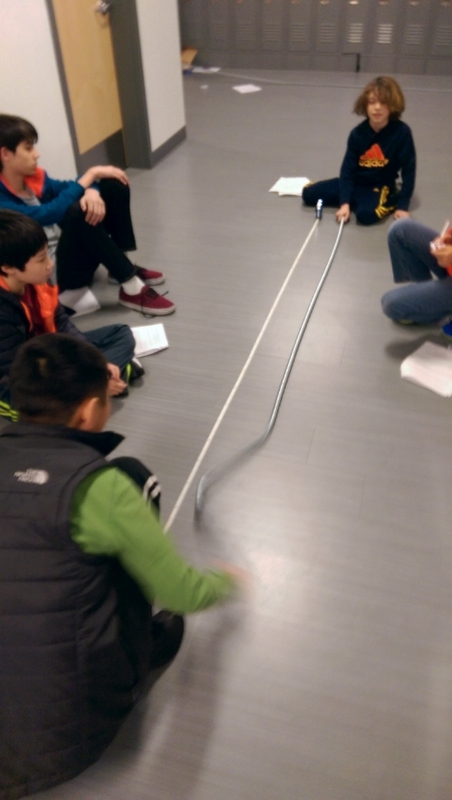 Students get hands-on with long springs to examine different types of waves (transverse and longitudinal); and measure wave speeds by observing constructive and deconstructive interference, interference patterns, and standing waves. Understanding the difference between an object's weight and its mass is often tricky for students, especially outside of science, people use these two words interchangeably. This lab is designed to allow the students to appreciate and understand the difference by measuring and weighing a wide-range of weights and objects in a very hands-on manner. We’re sure he will continue to devise more unique tactics that successfully demonstrate the laws of physics, and we can’t wait to check back in with him to see what he’s up to! We invite you to see more of Dr. Hale’s lab on our Facebook page. Through this series, Beyond the Microscope: Bringing the Sciences to Life Through Labs & Experiments we’ve been able to conduct our own mini-lab. We've successfully proven that BASIS Independent Silicon Valley Subject Expert Teachers are demonstrating more than just lessons, they’re showing just how much they truly enjoy sharing their passion with our students. And it’s no wonder…one of the many benefits of being a Subject Expert Teacher at BASIS Independent is that they get to share that mastery with students who are just as eager to learn about it.